"Convert any SWF file format flash video into a Windows executable exe file." 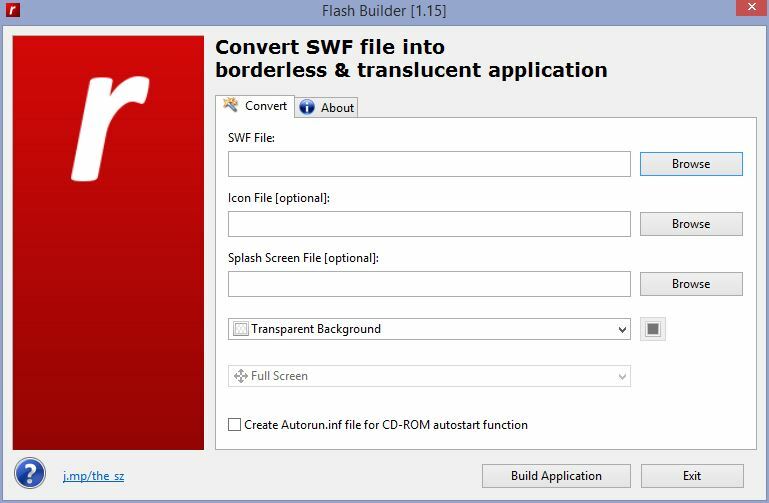 A very simple application that allows you to convert any SWF file format flash video into a Windows executable (exe) file that can be opened by any Windows computer without any more conversion. Using Flash Builder, the executable (exe) has no standard Windows user interface border and supports translucency of the video while it is playing. The process of converting the SWF file is quick and simple. You simply browse and select the executable file, can add a custom icon and splash screen, and the option for the video executable to be transparent when it plays. After that, you simply click "Build Application" and the file will be made for you very quick. You can even create a autorun.inf so if you burn the file to a CD, when the CD is inserted into a computer, the video executable will run right away without delay. This could be a great introduction to the CD if you have created a project, programs, and pretty much anything you want. It can be used for pretty much any idea that is personal to you and will run without a hitch. If you choose to, you can also add a custom splash screen which will show up for a few seconds before the video launches through the executable file. The option to add an icon to the executable file is a nice touch to further personalize the file's look so it appears professional and distinct. With all these options available to you in such a simple application, Flash Builder seems like a great application for someone that would like to be able to run flash video on their computer without special codecs media players, or to customize their CD or DVDs for a great introduction to the content on the disc.